Play kitchens are a great way for children to get creative and think outside the box. There are endless possibilities for your little ones to use their imagination and play different games in their play kitchens. Not sure where to start with your child? Here are 5 different ways your child can start using their play kitchen to “play outside the box”. It’s always a fun day when you can combine art with your creative play time. Using the idea of a pizza parlor is a simple way to combine both activities. All you need is some paper plates (the dough) and some coloring supplies to draw the toppings to get started. The possibilities are endless once you get your pizza maker in the kitchen. You can pretend to call in your pizza order, or your child’s imagination can go wild as they “top” the pizza with whatever ingredients they’d like. Once the pizza is “made” it’s time to pop it in the oven to cook. When the pizza is done, you can have them serve you at the parlor, or if you ask nicely they may even deliver you pizza! Drawing from your favorite cooking shows is a great and easy way to encourage creativity. Whether you have a group of kids or just one, this is sure to be a hit! Give your little chefs a fifteen-minute time limit to concoct the most creative and delicious dish they can think of. When time’s up, have everyone present to you what they made. To make things extra fun, you can even record their presentations so they can see what they would look like if they were on TV. Imitation is the sincerest form of flattery. Teaching your child to mimic whatever mom or dad is doing in the kitchen can help them learn basic kitchen practices and help keep them entertained. You can choose to “make” a meal together, and have them follow the recipe in their own kitchen. This not only keeps them busy but it also teaches them how some recipes are made! 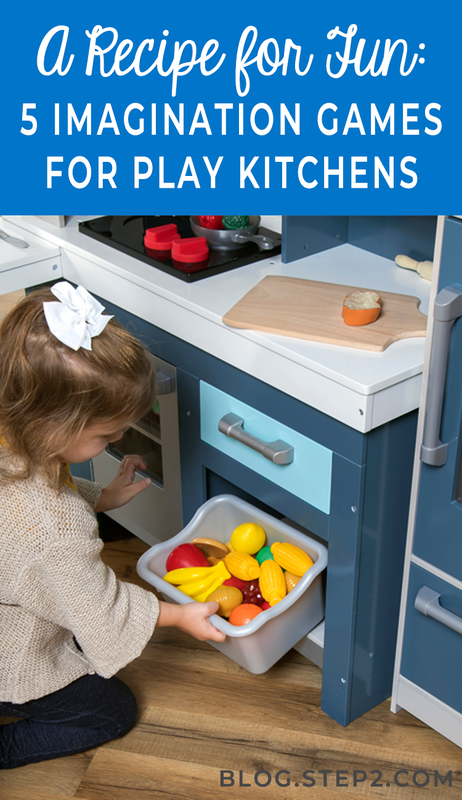 Did you know you can use your play kitchen to help your child with letter recognition and sound? It all starts with a tasty pot of alphabet soup! You can either write out letters on paper or use magnetic letters that you may have lying around the house. To get your soup started, have your little one dump all 26 letters into a pot and give the soup a big stir. When the soup is ready, you can ask them to find a specific letter. Once they locate a letter, you can ask them what sound the letter makes and to name something in their play kitchen that starts with the same letter. It’s time to get those creative juices flowing. First, give your child ten minutes in their kitchen to dream up their perfect dinner. Encourage them to get as creative as possible! Once ten minutes is up, it’s time to start drawing. Next, task your child with bringing their dream meal to life by drawing whatever meal they have dreamed up. Once they’re done with their drawing, have them talk to you about their dream dinner and what makes it so yummy. No matter which game you decide to start with, Step2 has plenty of options to get your child cooking. Shop our range of play kitchens today!